This page describes how to use the metric-selection tool to specify a target metric for an alerting policy. The chart next to the Target region gives you visual feedback on the data being captured by the target. The Target region uses the same metric selector that is used in Metrics Explorer and for creating charts. If you are already familiar with it, you can skip this page. By selecting entries from the lists. By typing directly to search the lists for matching candidates, including custom metrics. 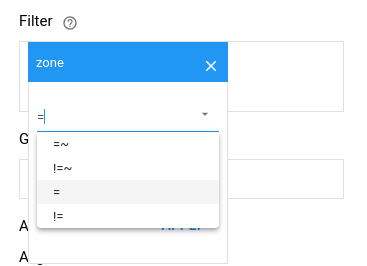 To search for custom metrics, type custom in the search box. Hovering over an item on either list brings up a tooltip that displays the information in the item's descriptor. For information on descriptors for metric types or monitored resources, see the metrics list or the monitored resource list. You can reduce the amount of data returned for a metric by specifying filter criteria, so that only time series that meet some set of criteria are used. 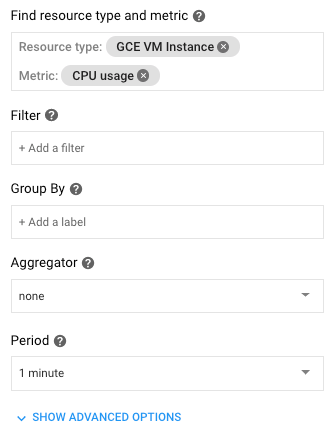 Filtering lets you restrict the number of time series from your chosen metrics that contribute data. This results in fewer lines on the chart that displays this metric, which can improve the performance of the chart. 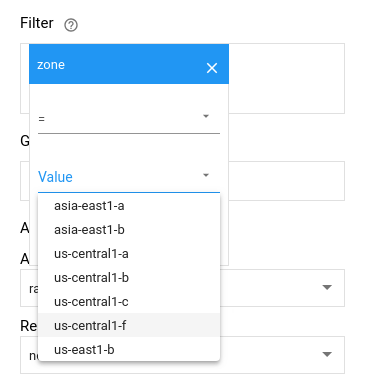 You can supply multiple filtering criteria. The corresponding chart shows only the time series that meet all of the criteria, a logical AND. 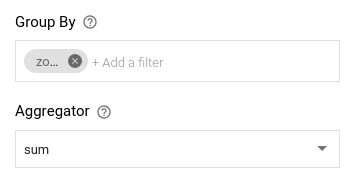 When you click in the Filter field, a panel containing lists of criteria by which you can filter appears. In broad strokes, you can filter by resource group, by name, by resource label, and by metric label. You can select from the lists or type to find matches. 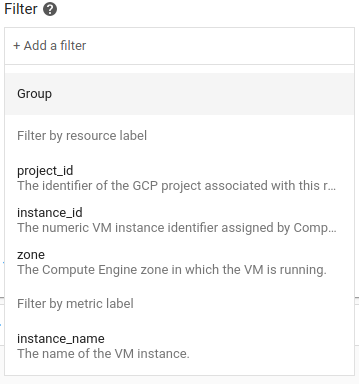 Additionally, you can create filters for data that has not yet appeared; such filter criteria won't appear on the selection list, but you can manually specify filters that you know will be valid in the future. After you choose a label on which to filter, you have to specify the rest of the filter: a value or range of values and a comparison. For example, the following screenshot shows a filter on the zone resource label. The Filter field supports a pair of comparison operators for equality, = and =~, and a pair for inequality, != and !=~. The second item in each pair takes a regular-expression as a value. Simple equality, =, is the default. See Monitoring filters for more information on filter strings. The Group By option lets you group time series by resource and metric labels, and then aggregate the data within those groups. This creates a single new time series for each group-by value, and the new time series represents all the members of the group. This reduces the number of lines on the chart displaying the metric, which can improve the performance of the chart. Suppose, for example, you want to examine logging load but only at a regional level; that is, you don't care about the number of entries from specific servers. You can group time series by zone, and then chart the total, average, or other measure for each zone. The default option for reducing a group of time series to one is to sum them. 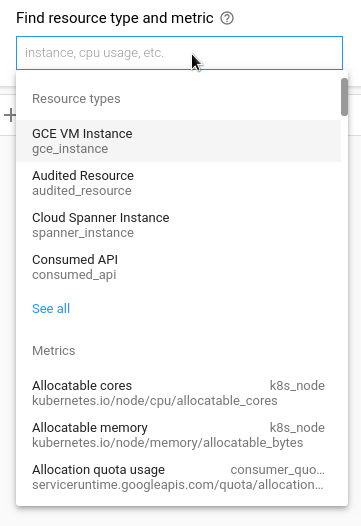 You do not set this manually, but you can change it; see Aggregation for more information about other choices. The following screenshot shows a grouping by zone. The choice of sum under Aggregation is the default. This creates a new time series for each zone, with values computed from the sum of all the values for individual time series in that zone. You can group by multiple labels, as well. When you group by multiple labels, you get a time series for each combination of labels. The order in which you specify the labels does not matter. Set the aggregation method back to none. Note: If you only delete the group-by labels, your chart will display a single line representing all of the data after the aggregation has been applied. To undo grouping, you must remove the group-by labels and reset the aggregation to none. The Aggregation option lets you combine time series based on common statistics. This results in fewer lines on the chart displaying the metric, which can improve the performance of the chart. The reducers available depend on the type of values the metric captures, but they commonly include choices like mean, max or min, standard deviation, assorted percentile values, and so forth. When used without filtering or grouping, aggregation is applied across all the time series in a metric, reducing them to a single time series consisting of the mean, sum, or other measure as calculated across all the time series. For more information on aggregation, see Aggregation in the API reference. You can also use aggregation in conjunction with the Filter and the Group By options. The Group By option automatically applies aggregation to compute statistics within each group. The lines on a Group By chart already represent aggregations. By default, Group By uses the sum aggregation choice. You can choose any of the other aggregation options for a Group By label. Note: Time series must be aligned before they can be aggregated. Both the Aggregation and Group by options use a default alignment strategy, but you can change this. See Alignment for more information on this. 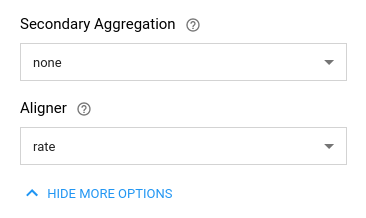 When you have multiple time series that already represent aggregations, like the examples illustrating the Group By option, you can then aggregate across them by choosing a secondary aggregation statistic. This further reduces the number of lines on the chart displaying the metric, which helps performance. A time series is a set of data points in temporal order. To align a time series is to break the data points into regular buckets of time, the alignment period. Multiple time series must be aligned before they can be combined. Alignment is a prerequisite to aggregation. When a time series is aligned, some technique must be chosen for creating a value for the time series at each alignment interval, for example, the mean response time per alignment interval. The default aligner used with the Group By and Aggregation options is sum. The Aligner option lets you change the default aligner for your selected metric to another valid option. Valid aligner choices depend on the kind and type of metric data a time series stores. That is, aligner choice depends on the MetricKind and ValueType of the time series. Some aligners both align the data temporally and convert it from one metric kind or type to another. For more information on the available aligners, see Aligner in the API reference. In this case, alignment intervals are short, and they are used for for longer periods of time. This results in a greater number of alignment points for a reporting period than with the coarse-grained intervals. In this case, alignment intervals are longer in general, and they are used for shorter periods of time, resulting in fewer total alignment points for a reporting period than with the fine-grained intervals. Different chart types use different granularities, and time series are realigned, for example, when you zoom in or out, which changes the data-reporting period. Users cannot choose the granularity or override the alignment-interval value. To hide the Secondary Aggregation and Aligner options, click Hide more options at the bottom of the pane. This does not clear any selected options. If you change or remove grouping, for example, forgotten choices for these hidden options can cause unexpected effects.